BIOGRAPHY of Léonie HANDZEL née HERZ. The family of Léonie, Marcel’s mother, came from Medernach, a town in Luxemburg located in the canton of Diekirch. According to the genealogy traced by Marc Schoentgen1 and passed on to us by the historian Georges Buchler2, her father, Lippmann Herz (1865-1943), a horse dealer, married Rose Samuel (1869-1938) at Medernach in 1895. The Herzes, like the Samuels, are of German origin3. Silvain Herz, his wife Irma Kahn and their sons Roger and Gaston went to Serécourt in the Vosges department in Lorraine. Silvain, Irma and Roger were deported from Drancy in 1942. Oziasz Handzel, his wife Léonie Herz, and their son Marcel sought safety at Sancé, in the Saône-et-Loire department in Burgundy. Léonie was born on September 3, 1905 at Medernach. Eliasz Oziasz Handzel, son of Mechel Handzel and Riwka Uhrmacher, born on January 8, 1899 at Przemyśl6 in Poland7, was named after his maternal grandfather. According to Oziasz’s birth certificate, his parents were unmarried8 and lived at n°7 rue Jagiellonska. Oziasz had four brothers and sisters older than he: Abraham Jakob (1887- ? ), Hinda (1890- ? ), Sara Zisla (1892- ?) and Cipora (1896-1942), all of whom were also born out of wedlock but recognized by their father, Mechel Handzel9. We were only able to track his sister Cipora (married name Rechtmann). She left Drancy in the convoy that departed on July 24, 1942 and died at Auschwitz on August 20, 194210. At that time the father, Mechel Handzel, was a merchant. After living in Poland Oziasz Handzel settled as a merchant, as indicated on his marriage license, in Dresden, Germany, before moving to Esch-sur-Alzette in Luxemburg. There, according to the researcher and historian Georges Buchler, he opened a confectionery in 1933 at n°2 rue Xavier Brasseur: the Confiserie de la Poste. He married Léonie, the youngest daughter of Lippmann Herz, on November 3, 1933 at Esch-sur-Alzette, and the couple had a marriage contract drawn up by the notary René Wagner in that town. On August 22, 1934 Léonie gave birth to Marcel. The couple first lived at 77 rue de l’Alzette in a house belonging to Léonie’s brother-in-law, Adolf Haïm Evlagon and then moved to n°17 on the same street in October, 1935, where they ran a renowned confectionery, the Confiserie de l’Hôtel de Ville13. The family resided in Luxemburg until the German invasion on May, 194014. Freezing of their bank accounts with withdrawals limited to 250 Reichmarks per month. The prohibition of payment in cash. The obligation to sell or transfer cash and gold to designated banks with remuneration in Reichmarks16. In 1941 a Luxemburg administrative commission provided the Gestapo with the file of Jews of Polish origin. All the Gestapo had to do then was to find the addresses of the Polish Jews. “This Jewish file was used to list, locate, intern and deport the Jews17.” Oziasz Handzel’s name does indeed appear in this file18, but he and his family had time to flee Luxemburg. In fact, along with around 50,000 civilians evacuated to France by the French army19, the Handzel family was allowed to take only 50 kilograms (110 lb.) of baggage with them and had to leave “all its valuables”20 for the Germans. As for their property, the German Civil Administration assumed the right to place it under its trusteeship or to confiscate it outright21. Cluny Municipal Archives, telegram from the Saône-et-Loire prefect announcing the arrival of the Luxemburgers. The Handzels, like many other Luxemburgers, arrived in the Saône-et-Loire department on February 28, 1941 and were provisionally authorized to stay for three months. On their journey from Luxemburg they may well have first detoured to Ancône in the Drôme department. This information was indirectly obtained from Gaston Herz, Marcel’s cousin and the sole survivor of the family22. They landed in Sancé, while Tekla, Léonie’s sister, and her husband, Adolf Haïm Evlagon, went to live in Mâcon on the rue Dombey. At Sancé, Marcel attended elementary school from the 12th of March, 1941. 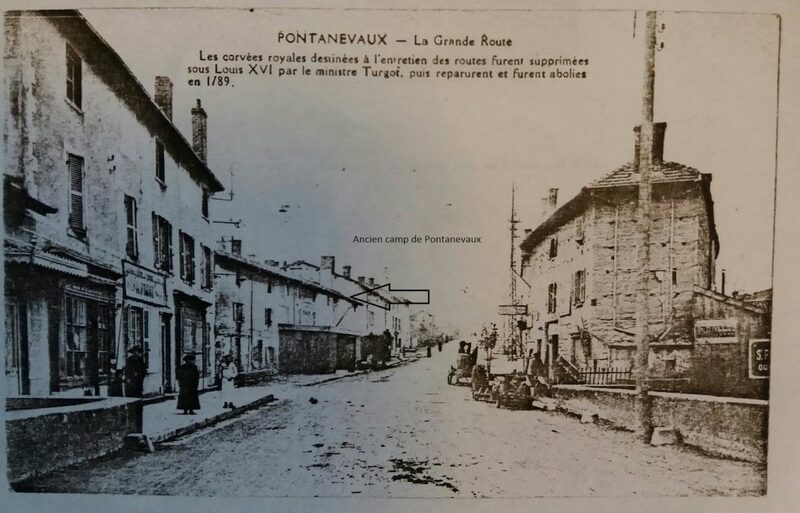 Even though Léonie and Marcel were identified as “Jews”, they were still free to come and go in Sancé, while Oziasz was incorporated into the Pontanevaux squad of foreign workers. The law of September 27, 1940, “Law governing the situation of excessive foreign workers in the national economy”, created the GTE (Groupes de Travailleurs étrangers): “Foreign Worker Squadsˮ. Article 1 stipulates “Male foreigners, as long as may be deemed necessary according to circumstances, over 18 and under 55 years old will be subject to being grouped together if they are overabundant in the national economy and if, having sought refuge in France, they are unable to return to their native countriesˮ. Jews who were “without any means of subsistence” were lumped into these foreign worker squads. On the contrary, those with resources were assigned to group residences. They had the status of “free workers” and had to check in at least every two weeks. Oziasz Handzel was incorporated into the 552nd GTE of Pontanevaux, located in the township of Saint-Symphorien-d’Ancelles, about twenty kilometers (12.5 miles) from Sancé. The Handzel family must therefore have been considered as lacking the means for subsistence. Oziasz may have worked for the municipality of Sancé, in which case he was allowed to go home at night “under surveillance”. According to Simone and Raymond Burtin, Oziasz probably held a post of municipal roadman27. The texts regulating GTE operation state that the wife of an interned worker was to receive of total of about 11.5 francs a day for her subsistence. The sum is hardly large, and we have no source to prove that Léonie and Marcel received the slightest subsidy. Therefore, mere survival, even with a meager wage, must have been the Handzels’ daily lot, unless the family came to France with some savings28. After the Wannsee Conference in January, 1942 Hitler designated the quotas of Jews that France was to deport. The French administration first deported the Jews in the big camps of the Free Zone, then those incorporated in the GTE’s having entered France after 193629, and finally the Jews arrested in the big roundup of August, 1942. According to Cédric Brunier, “the members of the GTE families could, if they wished, go with them, or they could be forced to leave30ˮ. Since neither Oziasz’s wife nor his son was arrested at that time, we can assume they were not forced to follow him. Collected there were 56 people of the 974th Ruffieux GTE, 104 people of the 514th Savigny GTE (Haute-Savoie) and 8 men, including Oziasz, of the Pontanevaux GTE. Most of the prisoners were German, Austrian, and Polish. The only Luxemburger was Osiasz Handzel31. Shut up in six cattle cars with some straw, a pitcher of water and a bucket to relieve themselves, the men left with rations composed of 2 cans of tinned fish, 100g of salt pork, 50g of chocolate, 100g of jam, 700 g of bread, and ½ liter of wine for a two-day-trip32. On August 24 they departed from the Culloz train station. Ironically, their train went through Mâcon to join up with the main convoy on the way to Drancy. At Mâcon Oziasz was only 5 kilometers from his wife and son. Their convoy arrived, via Tournus and Chalon-sur-Saône, at Drancy on August 25. The next day they left for Auschwitz, and Oziasz Handzel was one of the 1002 deportees in convoy n° 24. He was gassed on December 8, 194333. Only 23 people from convoy 24 survived. Marcel was enrolled in the village school on March 12, 1941. The boy spoke French fluently, having learned it, as well as German, in the primary school in Luxembourg34. The teacher of his class, Monsieur Lubin, was to be present at his arrest; described as a somewhat strict teacher, Monsieur Lubin had his pupils raise the flag every morning. Despite everything he never brought up the subject of the war in class. Marcel was completely integrated in school; a nice, calm boy and a very good student, he was well liked by his classmates; after school he would play in town with the other children. As Raymond Burtin35 was to confide, “We didn’t know he was Jewishˮ. For Sancé’s children he was simply a classmate, a buddy, which the photos preserved by the Burtins show: a boy like the others. The smallest of the band of four. As for Léonie, she did sewing to earn their living. We know that she went to get food at the Cordiers’ in Châtenay, a hamlet near Sancé. When she arrived at Drancy she deposited 10,000 francs, a sum certainly corresponding to pre-war savings and not to her earnings. French and American troops landed in Provence on August 15, 1944, and between the 4th and the 10th of September the towns in the Saône-et-Loire department were liberated36. Too late for Léonie and Marcel. Raymond Burtin has forgotten nothing of the events of that tragic day: On July 5, 1944 the Germans intruded into the classroom in Sancé during a morning class. The teacher stood there, pale, speechless; Marcel was called out and taken away at once, and his mother was arrested at home the same day. Class Register, Sancé, 1944, Saône-et-Loire Departmental Archives. In the “Observations” column is noted: “Arrested by the Germansˮ. Until July 31, 1944 they were interned at Drancy, where Léonie deposited her money and a gold ring, perhaps her wedding band, her last memento of her husband Oziasz. She and her son left in convoy 77 for Auschwitz, where they would be sent to the gas chambers on August 5, 1944. The decree of September 7, 201638, ordering the mention “Died in deporationˮ to be affixed to Marcel Handzel’z death certificate acknowledging his demise at Auschwitz in August, 1944. At Sancé, Raymond Burtin was ignorant of his classmate’s fate since 1944. And so, to finish the biography of the Handzel family we had the honor on May 12, 2017 of talking with Gaston Herz, 89 years old, a cousin of Marcel’s, and receiving his moving testimony. Roger Herz, Gaston’s brother, was born in Luxemburg, whereas Gaston himself came into the world in Metz, where the family had settled. He insists on being very clear: His father, mother and brother were all arrested by the French military police at Sérécourt in the Vosges department, where they had taken refuge, merely because they were Jewish. They were all sent to the Vélodrome d’Hiver on July 18, 1942, while he had escaped the roundup, hidden in nearby barn. He was never to see his family, deported to Auschwitz, again. “Only later was I to realize the feelings of catastrophe of a mother leaving a 13-year-old son alone in front of a shut-up house,” he wrote. Gaston Herz’s memories are cloudy, but he remembers that after fleeing he got work doing odd-jobs, before working in a factory at la Séauve-sur-Semène. Run, hide, survive. How he rejoined up with this aunt and uncle, Tekla Herz and Adolf Haïm Evlagon, no one knows, but they took cover at Sancé, perhaps thinking they might find Marcel, Léonie and Oziasz there. But of course, all three had already been deported. Did they live in the same house? Gaston Herz doesn’t remember this detail, but he does well recall that he was employed in a bakery in Mâcon, and that his boss hesitated not a moment to exploit a young adolescent, making him work fourteen hours a day. At last, the Liberation, flags flying, jubilation. But was it a true liberation for those who had lost all their loved ones? Georges Buchler is a researcher/historian at the National Museum of the Resistance in Esch-sur-Alzette. He has transmitted to us many documents and much information about the Herz-Handzel family, for which we thank him warmly. Salomon Herz, the father of Lippmann Herz came from Bosen-Birkenfeld (Germany), and Rose Samuel from Freudenburg (Germany). Former chief editor of the Voix du Luxembourg, Laurent Moyse is notably the author of Du rejet à l’intégration – Histoire des Juifs du Luxembourg des origines à nos jours, published by Saint-Paul. Deceased at Auschwitz: Silvain Herz, his wife Irma, and their son Roger (convoy n°11 that departed from Drancy on July 27, 1942); Oziasz Handzel, his wife Léonie, and their son Marcel. Died at Litzmannstadt in the convoy of October 16, 1941: Sophie Herz, Girsch Aronow, Julius Herz, his wife Simone Weill and their daughter Liliane; Louis Rosenfeld, his wife Bertha Herz, and their daughter Flora. Died at Theresienstadt : Lippmann Herz. The city is located in southwestern Poland, near the Ukrainian border. According to Wikipedia, “In 1931 the city counted 62,272 inhabitants. In 1939, after the invasion of Poland by Germany and the Soviet Union, the city of Przemyśl found itself on the border separating the zones of German and Soviet occupation. Between the 15th and the 19th of September of 1939 six hundred Jews were murdered by the Einsatzgruppen in the Jewish cemetery during the Przemyśl massacre. A large number of Jews managed to get across into the Soviet zone. In June, 1941 Germany attacked the Soviet Union and took control of the whole town. On June 20, 1942 a first group of 1000 Jews from the Przemyśl area was sent to the forced labor camp at Janowska. On July 15, 1942 the Nazis created a ghetto and shut up 22,000 Jews there. They were practically all exterminated at Auschwitz and Belzec. The Polish and Jewish resistance succeeded in saving 415 Jews. German archives reveal that 568 Poles from the region were executed for having come to the aid of Jews.ˮ The city was liberated from German occupation by the Red Army on July 27, 1944. They married on August 11, 1901, and all their children were legitimized by this marriage. Information furnished by Beata Mehl, May 12, 2017. Information furnished by Beata Mehl. Documents transmitted by Georges Buchler, historian/researcher. Information and photographs transmitted by Georges Buchler, historian/researcher. http://www.lessentiel.lu/fr/news/luxembourg/story/23237260 Of the 3700 Jews living in the Grand Duchy before World War II, 1200 died victims to the Shoah. Around seven hundred Jews were deported from Luxemburg to concentration camps. Only 56 survived. https://www.gouvernement.lu/844206/rapport_final.pdf 25.7% of whom were Luxembourg Jews and 74.3% non-Luxemburg Jews. p. 12.
 https://www.gouvernement.lu/844206/rapport_final.pdf 463 refugees arrived in the United States, 124 in Switzerland, 102 in Cuba, 217 in Belgium, and 1374 in France. p. 13. We have been unable to verify this information, as the archives are incomplete, the prefecture of the Drôme department having been totally destroyed by a fire on August 15, 1944 after the bombing of the bridge over the Rhône by the Americans. Archives départementales de Saône-et-Loire, 639W7. Asher Cohen. La Shoah. Paris, Le Cerf « Bref », 125 p.
 Archives départementales de Saône-et-Loire, W109287. Interview with Madame and Monsieur Burtin, March 22, 2017. The Burtin couple knew the Handzel family at Sancé during the war. See above the photo of the receipt for Léonie Handzel’s deposit of the sum of 10,000 francs upon her arrival at Drancy. Jews having entered France between 1933 and 1936 were also deported. Cédric Brunier, Les Juifs en Haute-Savoie de 1940 à 1944, Mémoires et documents de la Société Savoisienne d’Histoire et d’Archéologie, 2002, 227 p. 91. Idem., p. 95 et 134. According to historian Georges Buchler, “his death was officially declared in 1950 as being on the date of December 8, 1943 at Byskowice (Gliwice).” Satellite camps of Auschwitz were located around Gliwice. Interview on March 22, 2017, Sancé. The city of Mâcon was thus liberated on September 4th.